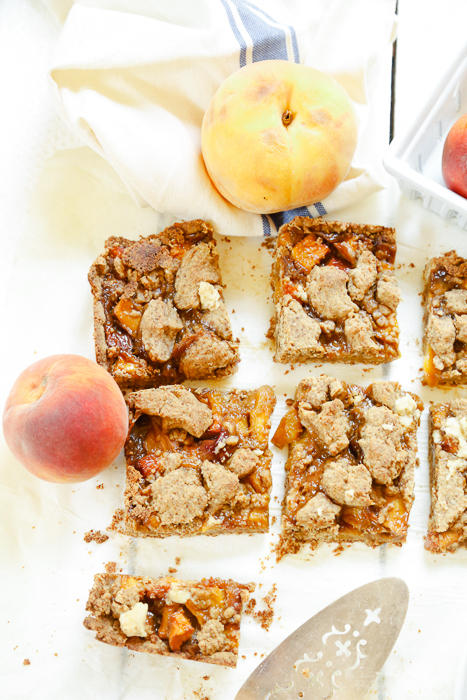 Peach Cobbler Bars — Welcome to Fitty Foodlicious! 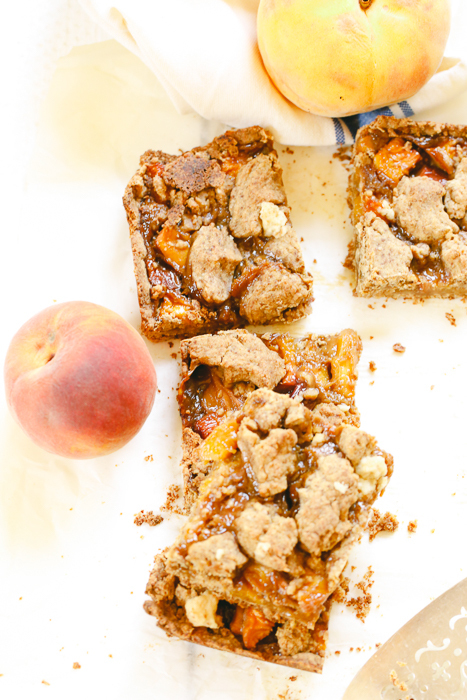 Peaches are still in season so add this healthy dessert to your baking list this week and make my Peach Cobbler Bars! These are fruity, sweet, and made without any refined sugars. They are perfect with a hot cup on coffee on a cool fall day! If you want to get really wild, add a scoop of your favorite vanilla ice cream! Have you ever bitten into a peach and life at that very moment felt just right? That’s me every time I bite into a peach. Peaches are juicy, sweet, colorful, and can really brighten up any day! I love peaches for their health benefits too! Did you know that peaches contain vitamins E and K, niacin, folate, iron, choline, potassium, magnesium, phosphorus, manganese, zinc and copper. Peaches are low in calories (100 g provide 39 calories), and contain no saturated fats. That’s pretty good stats for a piece of fruit! It’s still peach season on our farm and that means we have tons of peaches in my kitchen that I wanted to use in a creative way. Peach pie is delicious and it’s my go-to in the summer months, but I wanted something a little more festive and easy for the fall months! 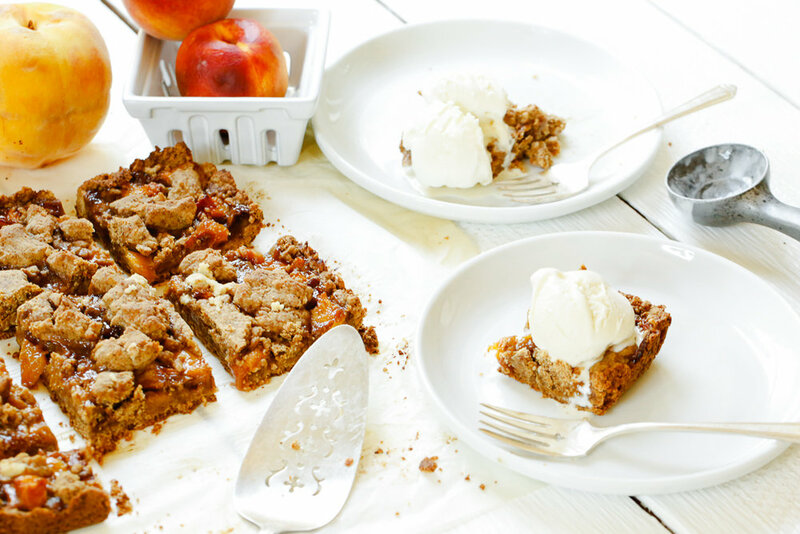 My Peach Cobbler bars can be eaten on the go and topped with your favorite ice cream if you want a yummy dessert option. The best about my Peach Cobbler Bars is that they are made without any refined sugars (unless you top them with ice cream of course. ;-) I tested out a gluten-free version too and made just as delicious of a batch using almond flour. Gluten-free flour would be another great option too if you prefer that. For the sweetness in these peach cobbler bars I used coconut sugar. Coconut sugar is an interesting sugar because it gives desserts a more robust flavor vs. using traditional sugar. I also noticed that it’s gives desserts more of a molasses flavor. It bakes up easily if used in proper proportions and mixes well in butter if you are using a stand mixer like I did in this recipe. For this recipe you will need a stand mixer, like a Kitchen Aide mixer or electric egg beaters. The first part of this recipe requires to mix the butter and coconut sugar together and doing that by hand is simply too much work and it won’t make a good consistency. 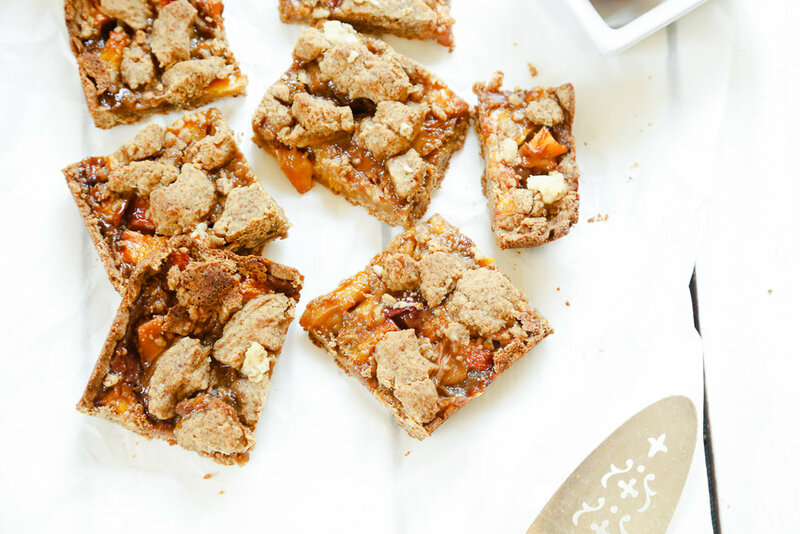 Make sure you have a an electric stand mixer or electric egg beaters before you make these delicious peach cobbler bars. What I love most about this recipe is that it uses minimal, simple ingredients. There is only coconut sugar, grass-fed butter, salt, flour, peaches, fresh lemon juice, and flour. That’s it! I do my best to use minimal ingredients whenever possible. This recipe is easy to make, just be patient with the butter and sugar step. Don’t over mix the butter and coconut sugar, you don’t want it to turn into a frosting. Just make sure to pulse for a few a minutes and the butter and coconut sugar should be just right. Once the crust is made and you’ve added it to the baking pan, store it in the fridge while you are making the filling mixture. That will firm up the crust and help it to bake more evenly. Let these bars cool completely before cutting into them. Top with a scoop of ice cream, grab some coffee and your favorite book and enjoy this easy, simple, delicious fall dessert! Make this recipe? Be sure and tag me on Instagram @fittyfoodlicious using the hashtag #fittyfoodlicious I love seeing my recipes in your kitchens! 1-stick plus 5 tablespoons of grass-fed butter, room temperature. For the crust: In a stand mixer, beat the butter and coconut sugar until it becomes light and fluffy. Do this for about 2-3-minutes. Scrape down the bowl. Next, add the flour and salt and mix again until dough forms. You want the dough to be clumpy (refer to the video) clumps are good. Don’t over mix the dough. Next, press the prepared crust mixture into the cake pan. Make sure to press the crust mixture into the sides of the pan as well. You want the crust to have walls so that the peaches don’t spill out while cooking. Store your prepared crust in the fridge while you prepare the filling. For the filling, stir together the peaches, coconut sugar, fkour, lemon juice, and sea-salt in a bowl. You could add cinnamon and nutmeg at this stage, but it’s completely optional. Once the peach mixture is combined, slowly pour onto the crust. Take your remaning crust mixture and sprinkle it onto the top of the prepared peaches. Make sure you squeeze the remaining crust mixture to create nice clumps. Bake for one hour or until the crust is golden brown and the center is nice and cooked through. If you find the crust is browning too quickly, top it with tin foil. Remove from oven and cool for one hour. Remove from pan and place on cutting board and cut bars into 2-inch squares.